"I love to smile now!" Many patients are discovering the benefits of dental veneers. Unlike a crown, which covers the entire tooth, a veneer is a thin covering that is placed over the front (visible) part of the tooth. Applying veneers is a simple, comfortable procedure that just takes a few visits. Veneers are a popular treatment option for several reasons. They generally are placed on upper front teeth that are severely discolored, poorly shaped or slightly crooked. Veneers can be used to lighten front teeth that are naturally yellow or have a grey cast and cannot be whitened by bleaching. Veneers are sometimes used to correct teeth that are chipped or worn. They also may be used to correct uneven spaces or a diastema (a large, noticeable gap between the front teeth). Ceramic Veneers are extremely thin shells made of a strong and durable dental ceramic. Dr. Melissa removes a small amount of enamel from the front and sides of the tooth. This makes room for the veneer and prevents the restored tooth from feeling or looking bulky or unnatural. Next, we make an impression of the prepared teeth so that the shape of the preparations and surrounding teeth can be replicated in the dental laboratory. Dr. Melissa also looks for the shade that will best match or blend with the other teeth. 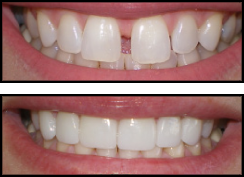 It usually takes a week or two to have the veneers custom fabricated. At the next visit, we place the veneers on the teeth to check the fit and shape. After any adjustment, the teeth are cleaned and the ceramic veneers are bonded to the teeth with dental cement. Resin-based veneers are generally placed in one appointment. After the tooth is prepared or reshaped, we carefully bond and sculpt the composite material to your teeth. A special light is used to harden the bonding. The veneer is smoothed and polished to look like a natural tooth. Patients who clench or grind their teeth are not good candidates for veneers, because the thin veneers may chip, break or peel. Avoid biting your fingernails and chewing on hard objects, such as pencils or ice. Like any dental restoration, veneers can be dislodged with time and with wear. In that case, new ones might be needed. As with all your dental care, discuss your expectations and treatment options thoroughly with us. No special maintenance is needed other than good oral hygiene each day. Look for oral hygiene products that display the American Dental Association’s Seal of Acceptance. Brush twice a day with fluoride toothpaste and clean between your teeth once a day with floss or another inter-dental cleaner.